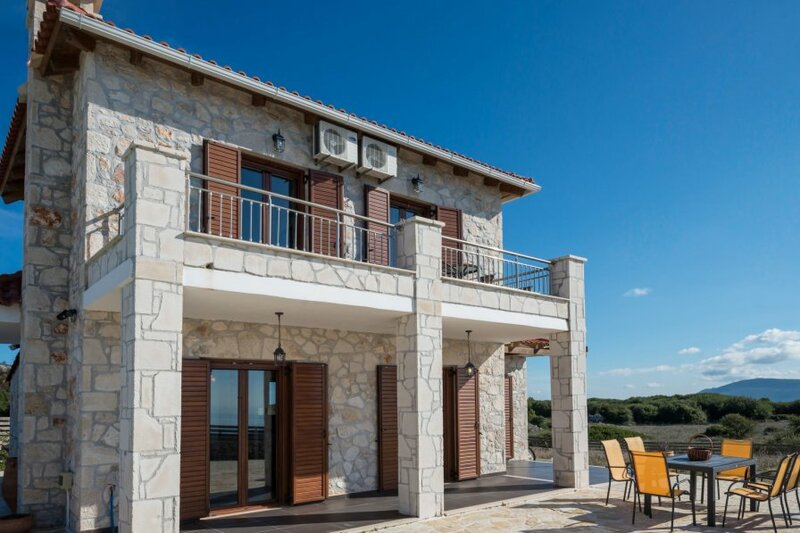 Volimes: Very beautiful, comfortable villa Traditional 1, 110 m a.s.l., 2 storeys. On the outskirts, 30 km from the centre of Zakynthos. Private: property (fenced), courtyard, swimming pool with privacy (01.05. and 31.10.). In the house: with TV, internet access, WiFi. Linen change 2 times per week. Towel change 2 times per week. Parking. Shop 1.5 km, grocery 1.5 km, supermarket 14 km, shopping centre 14 km, restaurant 1.5 km, bakery 1.5 km, cafe 1.5 km. Nearby attractions: The famous beach of Shipwreck, the Blue. Please note: car recommended. Suitable for families, suitable for seniors baby equipment on request. The apartment is located in a zone with limited traffic. Traditional 1, 4-room villa. Open large living/dining room with 2 sofabeds, open-hearth fireplace, satellite TV, CD-player, DVD and air conditioning. 1 double bedroom with 1 double bed and air conditioning. Kitchen (oven, 4 ceramic glass hob hotplates, microwave, freezer, electric coffee machine) with air conditioning. Bathroom. Upper floor: 1 double bedroom with 1 double bed and air conditioning. 1 double bedroom with 1 double bed and air conditioning. Bathroom. Comfortable furnishings in the country house style. Marvellous panoramic view of the sea, the mountains and the countryside. Facilities: washing machine, iron, mosquito net. Internet (WiFi, free). Suitable for families.